Santhigiri Ashram is located in Pothencode, Thiruvananthapuram. The ashram was founded by Navajyothisree Karunakara Guru 37 years ago. The ashram is equipped with a prayer hall, parnasala, sahakarana mandiram, work centres, kitchen, dining hall and accommodation facilities for more than 1500 inmates. The ashram functions on three fundamental principles viz. Annadanam (alms), Athurasevanam (helping the needy) and Athmabodhanam (self-realization). It has in place a healthcare approach based on the time-tested Indian systems of healthcare like Ayurveda, Sidha and Panchakarma. Santhigiri Ashram with its social and secular-spiritual activities, spread through out the world via its branch ashrams, devotes and offices. Santhigiri propagates and promotes the ideology of Navajyothi Sree Karunakara Guru, which is of secular spirituality and a united world with peaceful environment. At present, the spiritual head of Santhigiri Ashram is Sishyapoojitha Janani Amritha Jnana Thapaswini, the prime disciple of Guru. 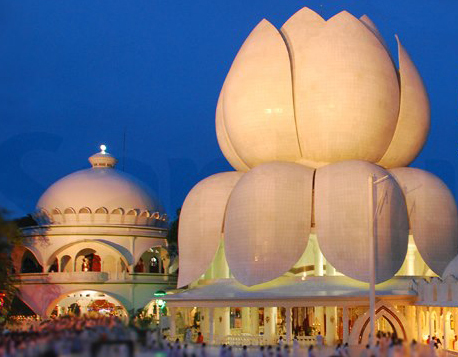 The main speciality of the Ashram is the monument called Parnasala in the shape of a blooming lotus in white Makrana marble in the Ashram compound. This unique structure took 10 years for completion. It was inaugurated by the President of India Pratibha Patil on 13 August 2010 and was opened for prayers and worship on 12 September 2010. Apart from its spiritual sanctity, The Lotus Parnasala of the Ashram has become a landmark of Trivandrum and is attracting lots of tourists.